Do you live in a tiny apartment? You’re looking to create more space, but have no ideas? When square footage is tights, you’ve got to use your imagination to create functional living space without clutter. One of the biggest challenges is where to place large furniture that you cannot live without, such as the bed. From classic loft beds to stunning bed designs suspended from the ceiling, there is no shortage of smart solutions that can maximize your living space. To get you inspired, here are 12 awesome ideas where to put a bed in a tiny room! 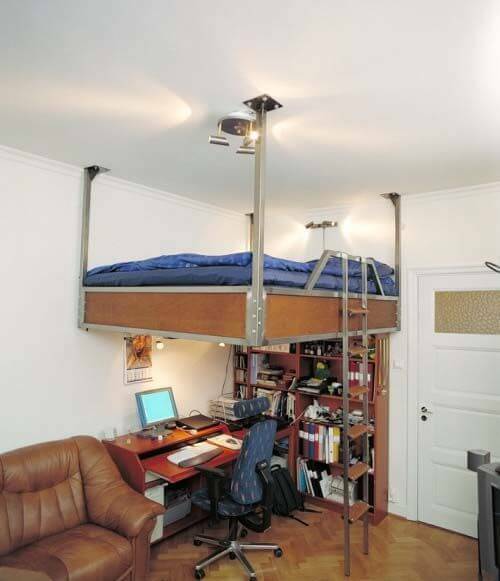 This adventurous idea is not for the faint-hearted:) One great way to open up a small place – hang your bed from the ceiling! You will not only have a unique sleep experience, but also free up a ton of space on the floor. However, its very important to make sure that the ceiling is properly reinforced and can carry the extra load. Also, you should not attempt this installation before you repair any crack or any other problems your ceiling may have. Be careful executing this installation on your own, unless you are an expert DIYer. To be safe, hire a contractor to do this unique project for you. As a college student, this post stood out. I always have the problem of too many things in too little of a space. If this post was available while I was organizing my room, I would have been able to avoid the problem completely. I will definitely be referring to this post in the future. Such creative an innovative ways to organize. Awesome pictures and unique architecture. Great post, thank you for sharing! Number five kind of reminds me of the Lego Movie! I want one. Loved the creativity. Each concept novel and beautiful. Thank you. I look forward to seeing more inspiring home space management and useful decor ideas. Double loft beds similar the black one available in various mattress sizes made to your choice of headroom, with a choice of sloping or vertical steps.. They come ready for you to paint wax varnish or whatever to your own taste. Awesome ideas. Makes me want to re-do our current bunk-beds. Dang. Great Collection of space savers! With more and more tiny houses becoming popular, ideas such as these are great examples that could be used in most any setting! So many cool beds. I had a loft built that holds a king-size bed. Added curtains below for a cave. Closet bed i prefer..thanx for this post guys.. I don’t know about the bed in the air, but the cube bed is nice. Nice! 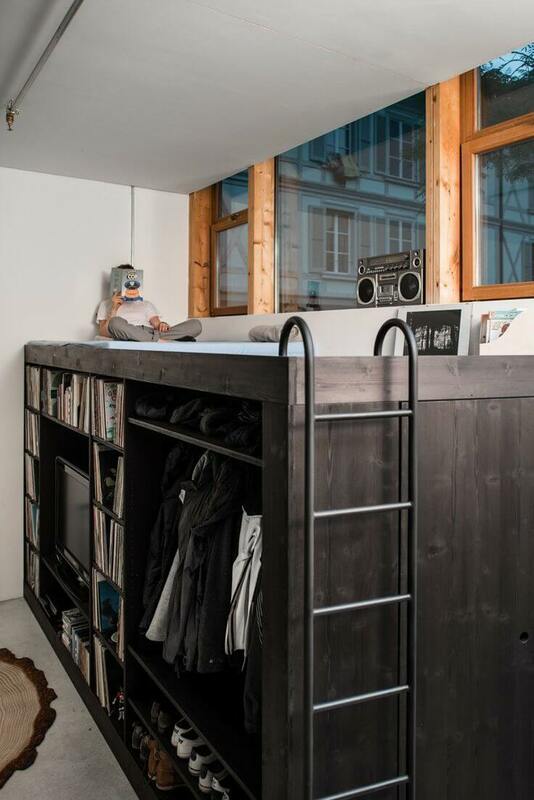 Those beds really utilize the space better and create more storage.